As a kid I had the habit of grabbing a handful of popcorn and using my tongue to snag each morsel like I was a giant lizard. It was the best way to eat popcorn. My hands formed a big bowl and I could eat individual kernels instead of simply stuffing my face. It was a practical solution to a popcorn problem that only a child could have come up with. 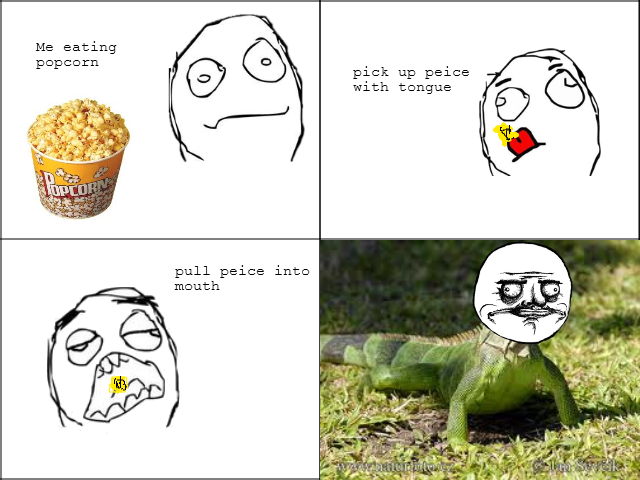 I applaud everyone else who also discovered lizard licking their popcorn. Eating popcorn with your tongue is easy. Get a handful of popcorn and shoot your tongue out at the popcorn. Your tongue will hit a kernel and stick to it slightly. As soon as your tongue makes contact, retract your tongue. The kernel should end up in your mouth if you did everything correctly. Eat the kernel and repeat the process. Don’t drool. That won’t impress anyone.